The tenth recorded perihelion passage of Halley's Comet occurred. While still an undergraduate at St. John's College, Cambridge, England, John Couch Adams wrote a memorandum of his intent to determine the position of an unknown planet from the irregularities it caused in the motion of Uranus. C. Jackson discovered asteroid #1367 Nongoma. Ernst Heinkel demonstrated the 800-kph liquid fueled He 176 rocket plane for Adolf Hitler at Roggentin. NASA and contractor technicians successfully conducted the final parachute drop test to qualify the Apollo CSM (Command and Service Module) Earth landing system. The Block II ELS was thus considered ready for manned flight. USSR launched Zond L1S-2 from Baikonur, the second attempt to use an N-1 booster to launch a vehicle to the Moon, which destroyed the launch pad when engines were shut down before the rocket cleared the launch tower. 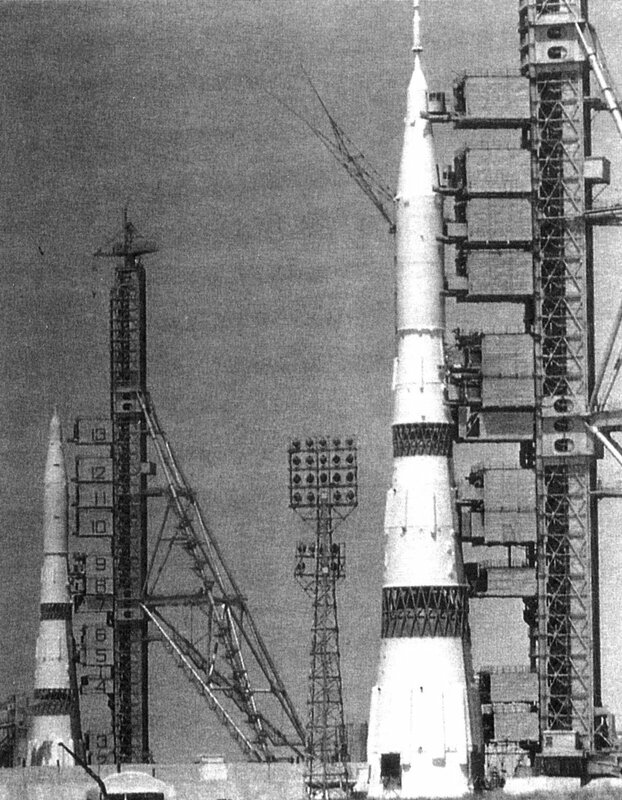 Zond L1S-2, launched 3 July 1969, was the second test of the USSR's powerful N-1 booster (SL-15/N-1). The payload, a Zond capsule with automatic cameras and a dummy lander, was supposed to be put into Lunar orbit. The cameras would have been used to record potential landing sites for future manned missions. The N1 was a massive rocket which stood over 100 meters tall, comparable to the American Saturn V, designed to send 95 tons of payload into low Earth orbit. It also had a very complex engine arrangement and propellant plumbing. In the rush to production, and to save money, its thirty NK-15 rocket motors were never ground tested in combination, only as individual units. Consequently, complex and destructive vibrational modes (which ripped apart propellant lines and turbines) and exhaust plume fluid dynamic problems (causing vehicle roll, vacuum cavitation, and other problems) were not discovered and worked out before flight. N-1 serial number 5L began to fail at 0.25 second after liftoff when the oxidizer pump of engine number 8 ingested a foreign object carried through a pipeline, suspected of being either a steel diaphragm from a pulse sensor which broke free from vibration, or a slag fragment from the oxidizer tank. The oxygen pump exploded, damaging some of the engines and electrical circuitry, and a fire ensued, causing the engines to be automatically shut down, and acceleration dropped below 1 G. 5-9 seconds after liftoff, at an altitude of 150 to 200 meters, just as the N-1 was clearing the launch tower, all of the engines shut down. The escape tower fired at the top of the brief trajectory, taking the Zond capsule away from the pad, and it landed 1 km away. The N1 crashed back on the launch pad at a 45 degree angle 18 seconds after liftoff, exploding on impact of the base of the N1 with the pad, destroying launch pad 110 east, and damaging the nearby launch pad 2 and an N1 engineering model (1M1) stationed there. Thus ended the last slight Soviet hope of upstaging the US Apollo 11 Moon landing. L. Chernykh discovered asteroid #3702. USSR launched Soyuz 14 ("Berkut" - "Golden Eagle") from Baikonur with cosmonauts Pavel Popovich and Yury Artukhin aboard, which docked with the Salyut 3 space station for 15 days, 17 hours. Per Lindstrand and Richard Branson set a hot air balloon distance record after going 907 miles in their 3400 mile Atlantic crossing, the first by hot air balloon. NASA launched SAMPEX (Solar Anomalous and Magnetospheric Particle Explorer) from Vandenburg, California, the first Small Explorer mission. 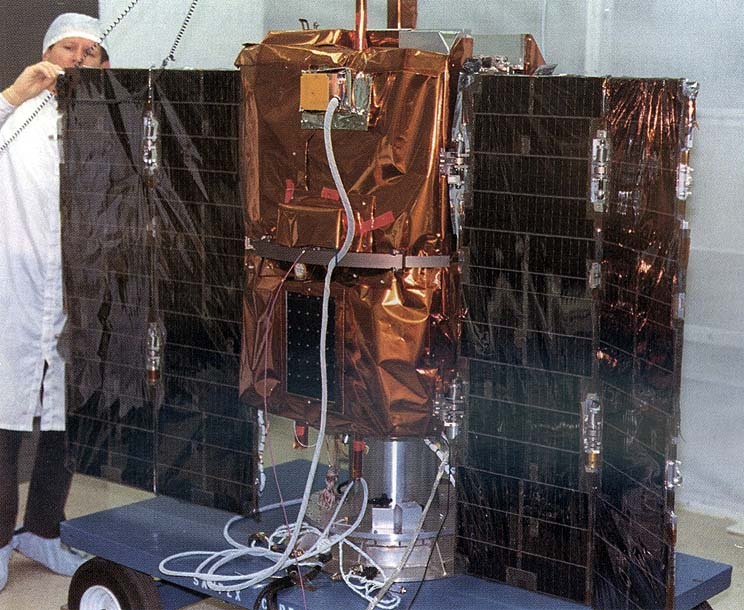 The Solar Anomalous and Magnetospheric Particle Explorer (SAMPEX), launched 3 July 1992, was the first of a series of spacecraft launched under NASA's Small Explorer (SMEX) mission of low cost spacecraft. The main objectives of SAMPEX experiments were to obtain data for several continuous years on the anomalous components of cosmic rays, on energetic particle emissions from the Sun, and on the precipitating magnetospheric relativistic electrons. It carried four science instruments: (1) low energy ion composition analyzer (LICA); (2) heavy ion large telescope (HILT); (3) mass spectrometer telescope (MAST); and (4) proton electron telescope (PET). The spacecraft used an on-board 3-axis stabilized solar pointed/momentum bias system, with the pitch axis pointed to the Sun. Solar panels provided operational power, including 16.7 W for the science instruments. The estimated useful lifetime of the spacecraft was about three years. An on-board DPU preprocessed the science and other data and stored them in an RPP unit of about 65 Mb, before transmitting in S-band at a rate of 1.5 Mb/s over Wallops Island, Virginia or a back-up station. The command memory could store at least a thousand commands. Russia's Soyuz TM-17 docked at the Mir space station's front port only 20 minutes after Progress M-18 undocked from the same port. China launched the second Fanhui Shi Weixing, FSW-2, from Jiuquan, for a 15 day orbital mission. China launched FSW-2 on 3 July 1994 into an orbit of 173 km x 343 km x 63.0 deg. The spacecraft remained in orbit 15 days, making four small maneuvers before successfully returning to Earth. The payload included Earth observation systems, a biological experiment, and microgravity research instruments. The retrievable capsule was recovered in China on 18 July. Russia's Soyuz TM-19 docked at the Mir space station for Mir Expedition EO-16. China launched the Apstar 1A communications satellite with 24 C-band transponders from Xichang, which operated in geosynchronous orbit at 134 deg E in 1996-1999. With the launch of the Nozomi (PLANET-B) orbiter toward Mars, Japan became the third nation to launch a planetary mission. Steve Fossett became the first person to fly solo around the world nonstop, in a balloon, landing in Queensland, Australia. 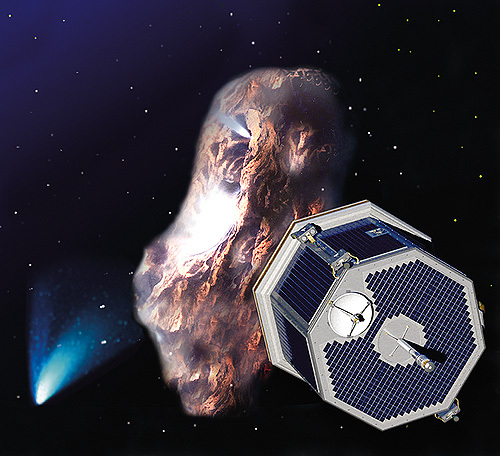 NASA launched the ill-fated CONTOUR (Comet Nucleus Tour) probe toward comets Encke and Schwassmann-Wachmann 3. The CONTOUR (Comet Nucleus Tour) probe, a NASA Discovery class mission, was successfully launched on 3 July 2002. Built and operated by the Johns Hopkins University Applied Physics Laboratory (APL), it began its five year mission to explore three comets, using repeated encounters with the Earth to modify its orbit in order to reach each target. Its primary objective was close fly-bys of two comet nuclei (Encke and Schwassmann-Wachmann-3) with the possibility of a fly-by of a third known comet (d'Arrest) or an as yet undiscovered comet. It was hoped that a new comet would be discovered that would be in the inner solar system between 2006 and 2008, in which case the spacecraft trajectory would have been changed if possible to rendezvous with the new comet. Scientific objectives included imaging the nuclei at resolutions of 4 meters, performing spectral mapping of the nuclei at resolutions of 100-200 meters, and obtaining detailed compositional data on gas and dust in the near-nucleus environment, with the goal of improving our knowledge of the characteristics of comet nuclei. The first burn of the second stage was completed at 0659 UTC, putting the spacecraft in a 185 x 197 km x 29.7 deg parking orbit. At 0746 UTC, the second stage restarted for a short 4 second burn to adjust the orbit to 185 x 309 km x 29.7 deg, and then separated once the PAM-D (ATK Star 48B) solid third stage was spun up. The 1.5 minute burn of the third stage motor at 0748 UTC put it and CONTOUR in a 90 x 106689 km x 30.5 deg phasing orbit. By 8 July, CONTOUR's orbit was 214 x 106686 km x 29.8 deg. CONTOUR was to stay in the phasing orbit until 15 August, when it was to be injected into solar orbit using its internal ATK Star 30 solid motor. Flyby of the first target, comet 2P/Encke, was scheduled for November 2003. CONTOUR was presumed lost on 15 August 2002 after numerous attempts to contact the probe failed. The spacecraft was scheduled to ignite its STAR 30 solid rocket engine at 0849 UTC (4:49 am EDT). This firing was to take CONTOUR out of Earth orbit and put it on a heliocentric trajectory. However, following the scheduled firing time, no further contact was made with the craft. Telescopic surveys were made under the assumption that the firing took place on schedule, and three objects were identified near the expected position of CONTOUR, leading investigators to believe that the firing took place and that these objects were parts of the spacecraft and rocket engine. An investigation board concluded that the most likely cause of the mishap was structural failure of the spacecraft due to plume heating during the solid rocket motor burn. Alternate possible, but less likely, causes determined were catastrophic failure of the solid rocket motor, collision with space debris, and loss of dynamic control of the spacecraft. If successful, the engine burn would have put CONTOUR in the proper trajectory for an Earth fly-by in August 2003 followed by an encounter with comet Encke on 12 November 2003 at a distance of 100 to 160 km, and a fly-by speed of 28.2 km/sec, 1.07 AU from the Sun and 0.27 AU from Earth. Three more Earth fly-bys were to follow, in August 2004, February 2005, and February 2006. On 18 June 2006, CONTOUR would then encounter comet Schwassmann-Wachmann-3 at 14 km/sec, 0.95 AU from the Sun and 0.33 AU from Earth. Two more Earth fly-bys were scheduled in February of 2007 and 2008, and a fly-by of comet d'Arrest was possible on 16 August 2008 at a relative velocity of 11.8 km/sec, 1.35 AU from the Sun and 0.36 AU from Earth. All comet fly-bys had a planned closest encounter distance of about 100 km, and would have occurred near the period of maximum activity for each comet. After the comet Encke encounter, CONTOUR could have been retargeted towards a new comet if one was discovered with the desired characteristics (e.g. active, brighter than absolute magnitude 10, perihelion within 1.5 AU).